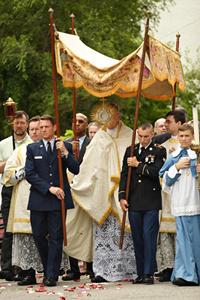 Priestly Ordinations on Tuesday, August 5 at 10:00AM at St. Francis de Sales Oratory. For the past several years, sacred ordinations of new Institute priests have taken place in Florence, Italy, at the beautiful church of SS. Michele e Gaetano. 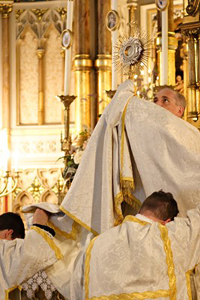 This year, in addition to Florence where four French deacons will be ordained to the priesthood, St. Francis de Sales Oratory in St. Louis, MO, will be honored to be the setting for the ordination of four American deacons, by His Eminence, Raymond Cardinal Burke. 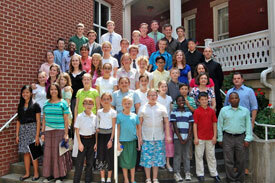 This important event in the life of the Church will take place here at the Oratory, on Tuesday, August 5, at 10:00AM. 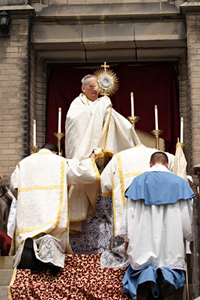 At 12:00 Noon, following First Masses, Solemn Te Deum and Benediction of the Blessed Sacrament will be celebrated by the Prior General and founder of our Institute, Monsignor Gilles Wach. 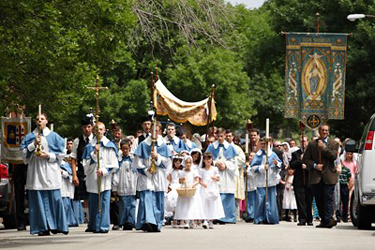 Already many visitors have made plans to come to St. Louis for the Ordinations. If anyone needs information on the accommodations available for this event in various hotels in St. Louis, please contact the Oratory office for the list and the special rates. As we count down to this great event, I would like to express my deepest, heartfelt gratitude to all the generous volunteers who are working to prepare for Ordinations. The labor required for all the behind-the-scenes preparations can only be sustained by a great love for God and for the sacred. Thank you! 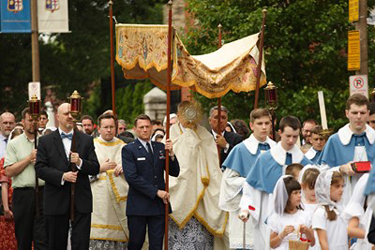 Many who attend Masses at St. Francis de Sales Oratory remark on the beauty of the liturgy and specifically on the music which is an integral part of the sacred liturgy. Occasionally on special events, such as the Gaudete Gala, many are deeply moved when they see the youthful faces behind the angelic voices. Regular weekly rehearsals are essential to our choirs, but the annual summer Choir Camp we have had since 2009 has been extremely effective in making our choirs what they are today. Like many good summer camps, the Choir Camp is fun, educational, and beneficial to the individuals who are fortunate to attend it. The Church at large draws a benefit too, in that the Camp helps to prepare a future generation to sing the treasured repertoire of Sacred Music. When they learn it at a young age, the young people’s formative experience in sacred music will stay with them for a lifetime. Whether you have a camper who will attend the Summer Camp this year or not, we cordially implore you to consider supporting the Choir Camp financially. We cannot minimize the fixed cost of running a summer camp, but if everyone contributes to it, we will be able to lower the cost and provide needed scholarships so that more children can participate. You may send a check directly to the Oratory, earmarked “Sacred Music Summer Camp”, or use a crowd-funding site we have set up to accept donations. Please invite your families and friends to visit this link too, so that they may consider supporting this worthy cause. 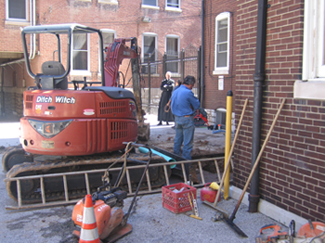 There have been an increasing number of sewer backups in the rectory in the past year, flooding the basement with smelly, brackish water. 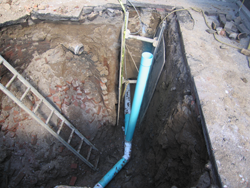 This happened every time there was a large rainfall, so we had a scope put down the drain and it was only able to progress several feet outside the basement, stopping under the parking area which indicated a sewer line break. 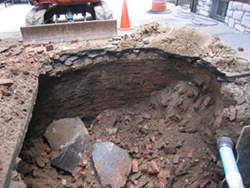 We employed a sewer repair company to open the area to about a 10 foot depth and a surprising discovery was made that the problem area contained an old brick cistern about 12 feet in diameter and 10 feet deep that had caused some of the problem, along with sewer problems at the building foundation and another collapsed sewer cleanout. All of the roof downspouts converge on this spot and were overwhelming the collapsed capacity of the sewer. New and larger plastic piping was installed and the hole was closed, hopefully resolving this irritating and unhealthy problem. Last November we experienced a strong wind storm which damaged portions of several buildings on campus. 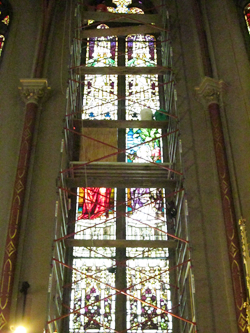 A large stained glass window in the sanctuary was one of the damaged items. “Emil Frei and Associates” assessed the damage and provided a report which included the insurance covered storm damage but also the more comprehensive repair of the window to assure its long term health. 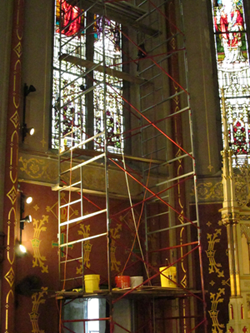 Scaffolding was recently erected to make these repairs, which will serve as a model for what is needed for all the windows and show how these improvements will sustain and enhance our iconic windows for the future. On Saturday, July 19, starting at 9:00AM, we will be cleaning the convent, where many priests of the Institute will be staying during the Ordinations. On Saturday, July 26, starting at 9:00AM we will be cleaning the Church, in preparation for the priestly Ordinations and First Masses of the newly ordained priests. If you are able to help out on either or both of these days, we would be most grateful. A sign-up sheet for each day is available at church every Sunday until July 13. More hands make this work lighter for everyone! If you have any questions, please contact Abbe Alex. Thank you very much for your generous response!